If there were ever an absolute confirmation that summer has officially arrived, it’s the start of the Vail Farmers Market. Ah yes, the juicy cherries and peaches, the freshly jarred Colorado honey, the one-of-a-kind arts and crafts, the constant aroma of smoky barbecue and sea of happy people. What would it all be without a soundtrack? 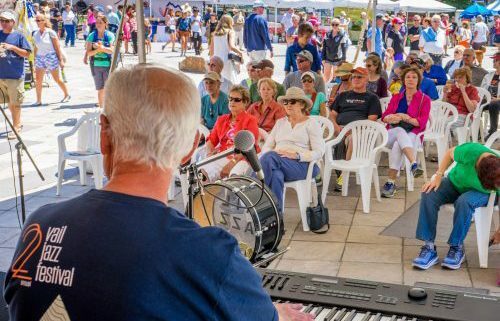 Follow your ears to free live music beginning this Sunday at the Vail Farmers Market with a rotating lineup of acclaimed regional acts from 12 to 3 p.m. in the Vail Jazz tent at Solaris Terrace. Showcasing homegrown, Colorado talent, the series kicks off with longtime alto saxophone master and swanky vocalist Max Wagner and his Quartet. With his latest recording, “Gratitude,” nominated Album of the Month by KUVO Jazz Radio, Wagner brings his array of upbeat originals, soulful bebop, Latin jazz, straight ahead jazz and romantic ballads to the Vail stage. He’s joined by Ken Walker on bass, Mike Marleir on drums and Jeff Jenkins on keyboard. Vail Jazz @ The Market continues every Sunday through Aug. 27 with a vibrant variety of artists, ranging from blues and Latin to swing and Brazilian. The series welcomes Max Wagner Quartet on July 30, Los Chicos Malos on July 2, Phil Wiggins and George Kilby Jr. on July 9 and B3 Jazz Project on July 16. Mark your calendars for Vail favorites BLT and Bob Rebholz on July 23, followed by a return of Chuck Lamb Quartet on July 30, Kathy Morrow & DZ on Aug. 6, The Hennessy 6 on Aug. 13, Joe Smith & the Spicy Pickles on Aug. 20 and wrapping up Aug. 27 with Katie Glassman & Snapshot. All music begins at 12 p.m. on Sundays at Solaris Plaza in Vail Village and is free to one and all – serious listeners soaking up the three-hour performance or casual strollers sitting down for a few minutes to soak up the shade.